This cute spring rabbit needlepoint design is professionally handpainted onto 18 mesh Mono Zweigart needlepoint canvas. The design area measures 8" x 8". The design is sold canvas-only or with fibers. if you select cotton we will send DMC embroidery floss; wool is Bella Lusso; the silk is Planet Earth Pepperpot silks. If you require stretcher bars we recommend two pair of 12". 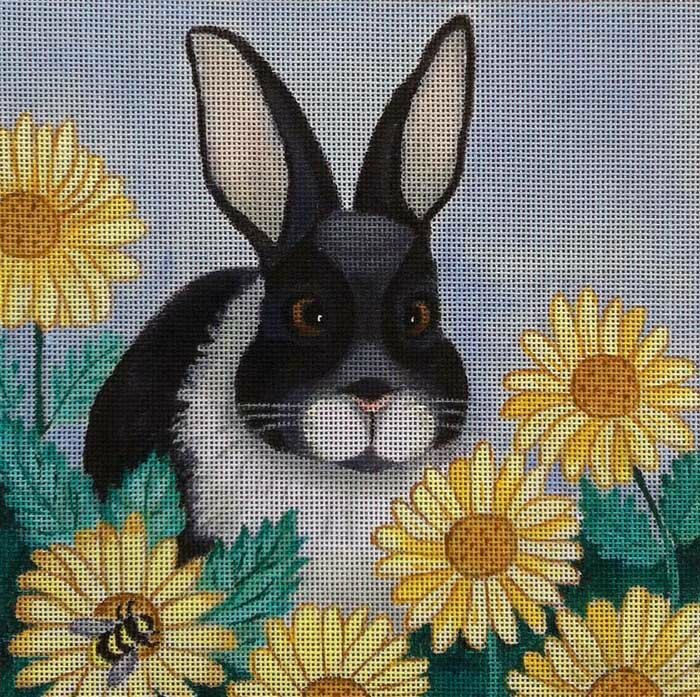 This Nenah Stone Needlepoint rabbit needlepoint canvas usually ships in about 1 week. If it is out of stock we will let you know and you will have the option of cancelling your order. Or you can contact us to check on availability. Orders of $ 100 or more ship for free ($ 150 for international destinations). For more about shipping costs and information see our shipping policy. Contact us if you have any questions about this Nenah Stone needlepoint canvas. We are always glad to help.